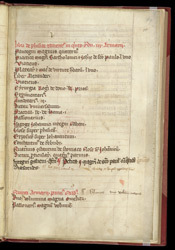 Medieval monks kept inventories or lists of the books in their libraries. These lists represent important evidence for determining where a manuscript was held during the middle ages. They also suggest what the intellectual interests of a community may have been, as well as the sources available to an author who worked in a particular location. This list of books was once part of a larger book containing theological writings and sermons which belonged to the Augustinian canons of Llanthony, in Wales, as we know from an inscription on a scrap of vellum which is bound in it. Llanthony was dissolved in 1539, this book and others kept by Richard Hart, the monastery's last prior, who passed them on to his nephew John Theyer. The red title tells the reader that this page provides a list of the books on 'physic' or pharmacology on Shelf 5, Bookcase V. The entry in darker ink at the end, added later, tells us that a copy of Dioscorides' "De materia medica" was placed in the bookcase, probably in the 14th century.